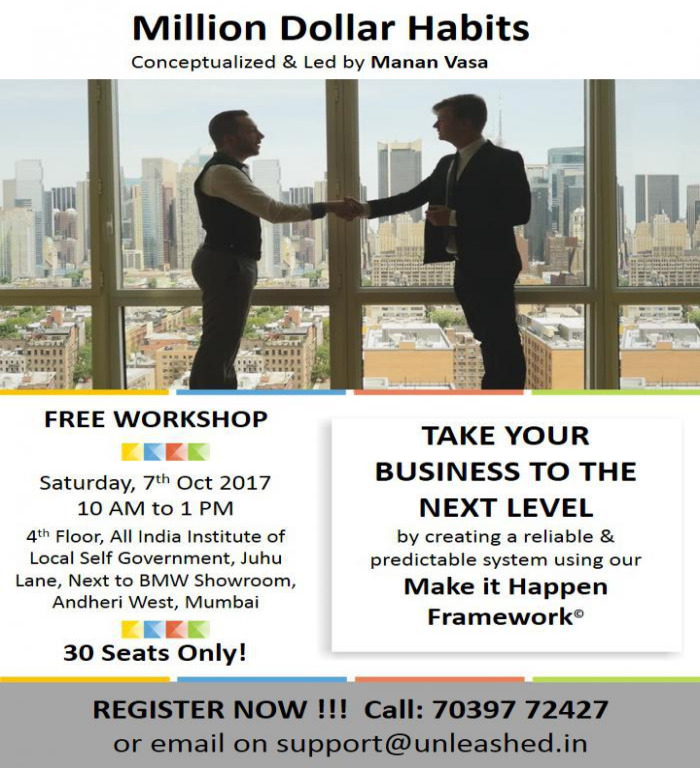 We are pleased to invite you for Free Orientation Program of Mastering Million Dollar Habits on Saturday, 7th October, 2017 conducted by Manan Vasa. 1. You will double your productivity. 2. Be in control of your life and work with power, freedom, focus & clarity. 3. You will alter your relationship with reality. 4. You will learn how to save 3 hours every day for the rest of your life, achieve your targets with ease & grace. 5. Accomplish those goals that always mattered to you where time, clarity & resources were reasons that stopped you. 6. Make your stress disappear & create sustainable work-life balance. 7. Convert everything you ‘have to do’ into ‘fun to do’ & live a purpose driven life & execute any project through completion. We ensure and handhold you, till you master the system and start observing the transformation within yourself and areas that impact you the most. To know how we successfully do the above, you must attend the Orientation scheduled on 7th October, 2017. Kindly confirm your presence for the orientation so that we can book a seat for you.